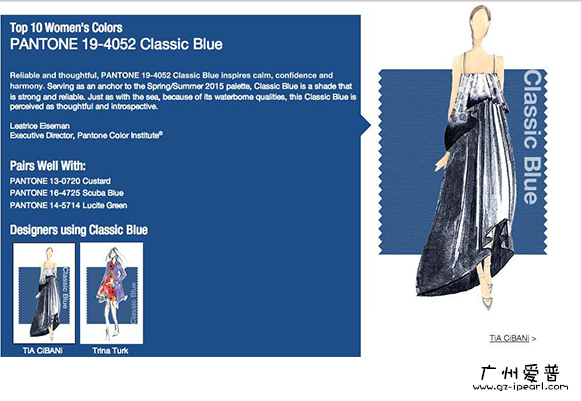 【Popular News】Pantone Release: 10 Fashion Colors in the Spring of 2015,GuangZhou I'pearl FLAVOR&FRAGRANCE CO.,LTD. 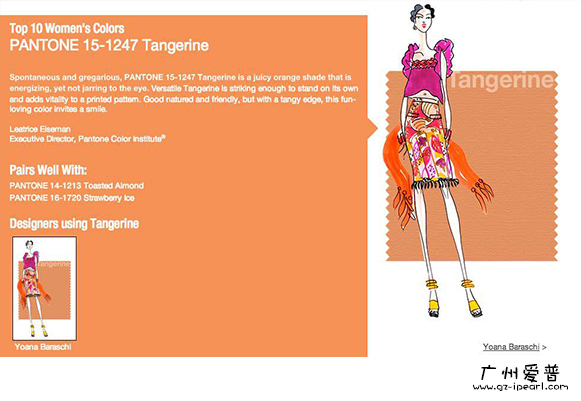 The color sensitive Pantone experts will make trend forecasting for next season after New York Fashion Week. Pantone also released a fashion color report of Spring 2015 recently—“Soft, Cool Hues + Nature’s Neutrals”will be the trend for next season. What modern people looking for is the main four aquamarine cool colors, except for marine tones, Pantone also chose some sweet colors, such as Toasted Almond, Strawberry Ice and Custard. The soft cool color mixed with light warm colors making us escaped from the noisy daily life into an exotic paradise that is pleasant and inviting. Scuba Blue conveys a sense of carefree playfulness. Even though a cool shade, the vibrancy of Scuba Blue adds a splash of excitement to the palette. Karl Lagerfeld stunned the audiences in 2014 International Fashion Week by the usage of Scuba Blue. Fresh and clarifying, cool and refreshing, Lucite Green has a feeling of homesick. Classic Blue inspires calm, confidence and harmony, also, it perfectly matches with other colors. A sun-tanned neutral, Toasted Almond offers comforting warmth and is indicative of a spontaneous spring, summer feeling, which feels like the soft sand in hand. It is the most natural color without any processing. Tangerine is energizing, yet not jarring to the eye. Versatile Tangerine is striking enough to stand on its own. Good natured and friendly, but with a tangy edge, this fun-loving color invites a smile. Sweet and sunny, Custard is a cheering tone that brings thoughts of pleasant relaxation and comfort food. Engaging with its soft and mellow warmth and full of good feelings, subtle Custard has an affable and easy disposition. Marsala serves as the foundation to the Spring/Summer 2015 palette. Much like the fortified wine that gives Marsala its name, this robust shade incorporates the warmth and richness of a tastefully fulfilling meal, while its grounding red-brown roots point to a sophisticated, natural earthiness. And it is a wonderful match with other hues. Glacier Gray is an unobtrusive gray that is timeless. Quietly assuring and peacefully relaxing, bouncing off other shades without taking away from them as it slips into the background to allow other colors to take center stage. But it dose the classic color in several Fashion Week.